How Often Should Women Cut Their Hair? Knowing how often to cut your hair has a lot to do with your hair goals and the chemical processes you put your hair through on a regular basis. This guide should help you set up your own haircut schedule without making you want to pull your hair out. It's important to know that hair grows on an average of a 1/2-inch every four weeks. Of course, some people's hair grows a little faster than others. If your hair is long, and you want to keep it long, it is very important to get regular haircuts to keep it healthy-looking. Long hair is very old. Like anything that ages, the older your hair gets, the more fragile it is. Long hair is typically more susceptible to breakage, split ends and to appearing thinner. If you color or highlight your long hair, it is even more likely to be damaged. Regular haircuts help keep your hair strong and healthy. Long hair should be trimmed at least every eight to 12 weeks. If you notice more breakage or split ends, it could be cut as frequently as every six to eight weeks. Be specific with your hairstylist when you're getting your haircut. If you'd like your hair to grow longer, ask your stylist to trim a half an inch or less off the ends. If you'd like your hair to stay the same length, you'll want to ask her to trim more off the ends. The same rules generally apply for medium-length hair as they do for long. Regular haircuts at six- to12-week intervals are important to keep your hair healthy. If you like the length of your hair, a trim every six to eight weeks will keep your hair at your preferred length. 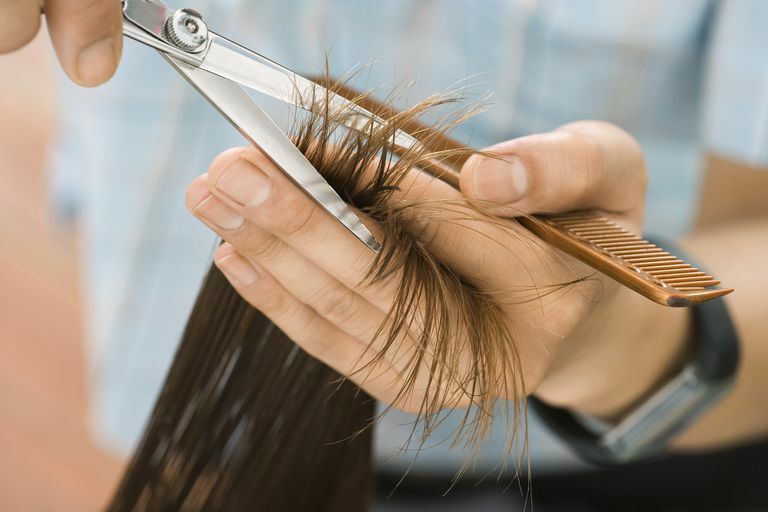 If you are growing your hair out, opt for a trim every eight to 12 weeks instead. Short hair, especially if you want to keep your short style, needs to be cut more frequently to stay fresh. If you have short hair, you already know that it appears to grow out quickly. Short hair should be trimmed every four to eight weeks to keep the shape of your haircut looking good. If you color, highlight, perm or chemically straighten your hair on a regular basis, you might notice that your hair needs trimming more frequently. Chemical processes can cause hair to break, split or become dry. More frequent haircuts can help prevent over-drying and breakage. Many people make the mistake of not getting their hair cut regularly when they're trying to grow their hair out. It's also a common myth that regular haircuts make your hair grow faster. Here's the truth: Regular haircuts do not make your hair grow faster. Rather, regular trims prevent your hair from suffering breakage and split ends that make your hair appear to grow slower. The most important aspect of growing your hair out is to communicate with your stylist and have the ends of your hair trimmed slightly at regular intervals. This minimizes hair breakage and maximizes your growth potential. How Often Should You Touch-Up Relaxed Hair? Guys: How Often Should You Get a Haircut?